“In the Louvre museum hangs a portrait of a middle-aged man with long dark hair, a mustache, and heavy-lidded eyes, and he is dressed in the starched white collar and black coat of the typical Dutch burgher. The painting is now the iconic image of René Descartes, the great seventeenth-century French philosopher. And the painter of the work? The Dutch master Frans Hals–or so it was long believed, until the work was downgraded to a copy of an original. But where, then, is the authentic version located, and who painted it? 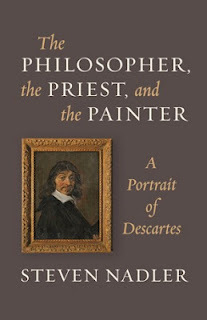 Is the man in the painting–and in its original–really Descartes? Volgend artikelScharrel bij de bank.